My great-grandfather, Gordon "Frog Eye" Wilson. My Granny Janice gave this picture of her dad to me several years ago. 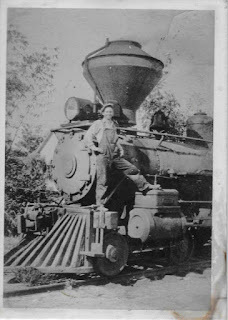 I found myself drawn to it and began imagining what it must have been like for my great grandfather to work on the train line that traveled from Robbinsville, NC to Topton, NC. I asked my Granny if she remembered anything about the time her dad spent working for the railroad. Most of her memories come from the time he spent as engineer when the train served as a tourist attraction. She remembers taking my dad and his brothers on a train ride with their grandfather. He was referred to as "Frog Eye Wilson" by most people who knew him. The train's announcer, Jim Wood, also referred to him as such as he introduced him to the passengers. Granny told me that Mr.Wood would sing Life's Railway to Heaven as the train traveled along those winding tracks. There are a few versions of this song but I like Johnny Cash's the best. I came across this 1970 Chicago Tribune article as I was looking for information about the Bear Creek Scenic Railroad. I'm sure that it was a pretty big deal to have an article written about the little town of Robbinsville all the way up in the big city of Chicago! "Brand new Graham County Railroad Company's Shay/Number 1925 stands outside the Lima Locomotive Works factory in Lima, Ohio - February, 1925." Image available from the NC Historic Sites. The Graham County Railroad Company was chartered in 1905 but because of some problems, didn't become operational until 1925. This line peaked in the late 1920s and early 1930s, taking sawed lumber out of the mountains and bringing fresh produce, general merchandise, hardware, and household goods into Robbinsville. The company continued to haul freight until late 1970 when service was discontinued until a larger amount of freight could be developed and assured. The original steam Shay locomotive was still in operation and the Graham County Railroad became famous all over the United States as the last steam freight line in the country. In 1966, Bear Creek Junction was organized and a scenic steam train took tourists on a 12 1/2 mile ride through the mountains. It remained successful for several years before closing in the late 70s. Graham County's No. 1925 Shay is currently at the NC Transportation Museum.